Mention the words green salad to anyone and they will almost always instantly think of boring food, which in itself can be a barrier to getting people to try salads as the image of lettuce and cucumbers instantly spring to mind. There are numerous ways to jazz up a green salad and banish those thoughts of boring food suitable for those on a health fad diet. One of the ways that a green salad can be made more appetising is to add additional ingredients, such as pita chips. First we should examine what is required for a green salad. As the name suggests, a green salad consists mainly of ingredients that are green in colour. These can include that old favourite cucumber along with spring onions, celery and lettuce. Tomatoes, parsley or coriander can also be added, along with a small amount of salt and pepper. Combine the ingredients together and put in your refrigerator. Now we move on to the pita chips that will go with your green salad and lift it out of the ordinary. 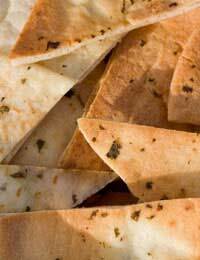 For the pita chips use pitta bread and approximately 1/8 of a cup of olive oil for each pita loaf that you use. You will also need some salt. To prepare your pitta loaves of bread for your green salad, first brush the pitta loaves on each side with olive oil before adding a small amount of salt to the loaves. The next stage is to divide the pitta loaf into slices. Then place the pita loaf in an oven, set at 350 degrees F, 180 degrees C, gas mark 4 for approximately 8 minutes. During this process you can, depending on your preference, take some Parmesan and sprinkle it over the pitta. After approximately 8 minutes have elapsed the pitta loaf should be a light brown colour and should also have a crunchy feel to it. Once your pitta bread is cooked, take them from the oven and allow to cool for approximately 10 minutes. After the pitta bread has cooled break it up, you can do this by using your hand, and add to your green salad. The next stage is to add your salad dressing. To make things even more interesting it is possible to use an aubergine, along with yogurt sauce, chopped chives and green peppers in your green salad. Roast the whole aubergines for approximately 30 minutes at 162 degrees C or 325 degrees F, ensuring that you have first poked holes in them. After baking, allow to cool for approximately 10 minutes before slicing open and removing the flesh from the aubergine. Next squeeze out all excessive water from the aubergine, using a strainer and a spoon, and add to the ingredients already mentioned in the first part of this recipe. The yogurt sauce can be made using plain yogurt, peeled and diced cucumber, fresh mint and a seeded and diced pepper. Once all these ingredients have been blended, the yogurt sauce can be served as a side sauce.